• require high levels of adherence to obtain optimal patient outcomes and to prevent waste of financial resources. Advancements in biotechnology have led to the development of new specialty drugs, which act at the cellular level to change the course of disease rather than treating symptoms alone. This provides hope and offers a better quality of life to patients struggling with life-threatening or chronic conditions for which no therapeutic options were previously available. 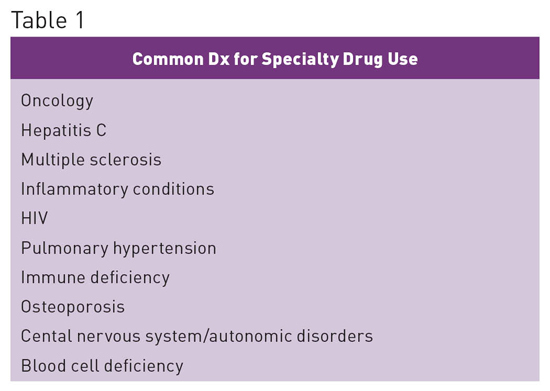 See Table 1 for a list of common conditions in whose treatment specialty drugs are used and Table 2 for a list of the top specialty drugs used to treat those conditions. • 37.7% of drug spend is for specialty medications, with the number expected to increase to 50% by 2018. • In 2015 spend increased by 15% to $121 billion. • Spend has doubled in the last five years, contributing 70% of overall medicine spending growth between 2010 and 2015. • Accounts for 36% of nondiscounted medicine spending, up from 24% in 2010. • Increase in spend has primarily been associated with treatments for hepatitis, autoimmune diseases, and oncology. 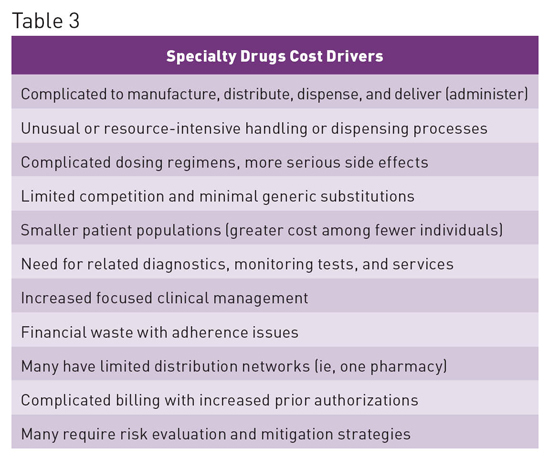 See Table 3 for cost drivers associated with specialty drugs. Under the Medicare Part A benefit, skilled nursing facilities (SNFs) are reimbursed to provide for the overall care of the patient, including most medications. As the utilization and cost of specialty drugs rise, current Medicare Part A reimbursement methodology may be inadequate to cover the expense associated with these high-cost medications. Without addressing the discrepancy between the high cost of these medications and adequate reimbursement, it may become more difficult for patients requiring skilled nursing care to find placement in an SNF. This also has the potential to lead to additional costs if the length of hospital stay is extended. SNFs have been given little guidance as to whether patients admitted to an SNF under Medicare Part A should be permitted to bring and use their home specialty drug supplies. This is complicated because those supplies may have been obtained through Medicare Part D, Medicaid, or other insurance payers. And because of the limited distribution and high costs of many specialty drugs, the specialty pharmacy supplying these medications may be unable to send additional supplies of medication before they are due to be refilled. Without the ability to use a patient's home supply, patients may be unable to be admitted to a nursing center, or if a patient is admitted, he or she could go without necessary medications. SNFs face additional regulatory risk due to requirements for medications to be readily available. For the most part, SNFs utilize one contracted long term care pharmacy with specialized knowledge and expertise in working with long term care centers and patients. The need to obtain many specialty drugs from another pharmacy with additional policies that don't align with those of the SNF can increase the risk of errors and lead to medication availability issues resulting from distribution issues beyond their control. Current regulations fail to address the specific challenges presented by current specialty drug trends, in part due to the rapid growth of the specialty drug market and also due to these medications having previously been used in settings outside of long term care. For patients in the community including nursing homes and assisted living facilities, the medication could no longer be obtained from a local retail pharmacy or long term care pharmacy. Instead, all prescriptions now had to be provided by one specialty pharmacy: Walgreens Specialty Pharmacy. Only after insurance verification and copay collection could the prescription be mailed to a patient's home, with most prescriptions being mailed overnight.7 Consideration is required to help ensure supplies are not shipped to a patient's home address but rather to the SNF address. Further delays can occur due to the need to obtain prior authorization approval from payers. As the increasing trend in specialty drugs continues, increasing pressure will be placed on the health care system to address both cost and distribution issues. Payers will need to evaluate current reimbursement models. In addition to cost concerns, regulators such as the Centers for Medicare & Medicaid Services will need to provide greater guidance around the utilization of specialty drugs in SNFs so that conflict with current regulatory requirements is avoided while continuing to ensure quality patient care is provided. Health care professionals will need increasing training on the use of these medications, with improved communication pathways required between stakeholders to help ensure these medications are both affordable and accessible to prevent delays in therapy. — Mark D. Coggins, PharmD, CGP, FASCP, is vice president of pharmacy services and medication management for skilled nursing centers operated by Diversicare in nine states and is a director on the board of the American Society of Consultant Pharmacists. He was nationally recognized by the Commission for Certification in Geriatric Pharmacy with the 2010 Excellence in Geriatric Pharmacy Practice Award. 1. The Express Scripts Lab. 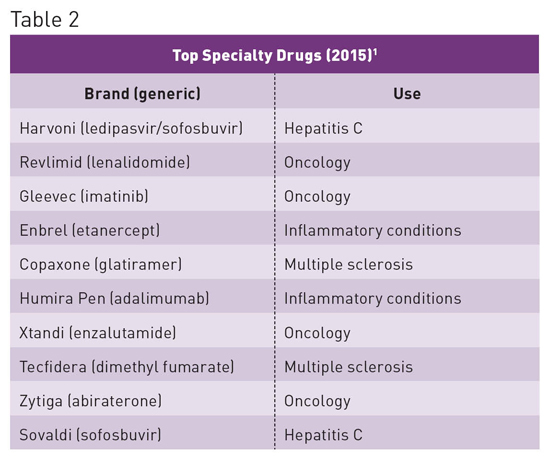 Express Scripts 2015 drug trend report. http://lab.express-scripts.com/lab/drug-trend-report. Published March 2016. Accessed June 12, 2016. 2. Kirchhoff SM; Congressional Research Service. Specialty drugs: background and policy concerns. https://www.fas.org/sgp/crs/misc/R44132.pdf. Published August 3, 2015. Accessed June 12, 2016. 3. Johnson CY. Specialty drugs now cost more than the median household income. The Washington Post. November 20, 2015. https://www.washingtonpost.com/news/wonk/wp/2015/11/20/specialty-drugs-now-cost-more-than-most-household-incomes/. Accessed June 10, 2016. 4. Distribution dispensing and site of care. Midwest Business Group on Health website. http://www.specialtyrxtoolkit.com/specialty-pharmacy-101/distribution-dispensing-and-delivery. Accessed June 12, 2016. 5. Limited distribution medications. Avella Specialty Pharmacy website. https://www.avella.com/services/limited-distribution-drugs. Accessed June 14, 2016. 6. Beck J. The drug with a 5,000 percent markup. The Atlantic. http://www.theatlantic.com/health/archive/2015/09/daraprim-turing-pharmaceuticals-martin-shkreli/406546/. September 22, 2015. Accessed June 15, 2016. 7. Mahoney MV. New pyrimethamine dispensing program: what pharmacists should know. Pharmacy Times. 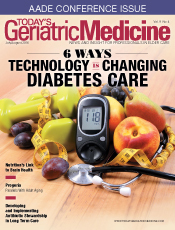 July 17, 2015. http://www.pharmacytimes.com/contributor/monica-v-golik-mahoney-pharmd-bcps-aq-id/2015/07/new-pyrimethamine-dispensing-program-what-pharmacists-should-know#sthash.GLYKi6pw.dpuf. Accessed June 15, 2016.